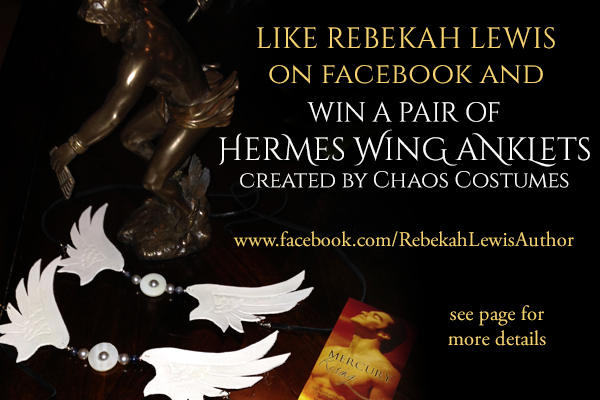 Win a pair of Hermes wing anklets (unfortunately they will not give you the ability to fly nor super speed, but they do carry upon them much awesomeness). 2. For a second entry into the giveaway, share the anklet graphic (pictured above) from my Facebook page. This way I can find it. If you share from another person’s share or post the graphic yourself I may not be able to see you have shared in order to add your name in to the generator on Random.org to draw the name. The goal is to reach 500 likes. So however long it takes to reach the targeted number up to June 1, 2015 in which I will award the prize regardless. However, if you would like to sweeten the pot… This giveaway holds firm to the 500 likes limit, but if it can double that and hit 1000 by June 1, 2015, a lucky Facebook fan of mine will win an ARC of Satyr from the Shadows whenever it is available (because it hasn’t gone through edits yet so I cannot give a definite date on that at this time). Disclaimers: this giveaway is in no way sponsored, endorsed or administered by, or associated with Facebook nor Chaos Costumes, although I was given permission by Chaos Costumes to use their product for a giveaway promoting Mercury Rising at the time of commissioning the items.